Many of the young traders on the floor of the Toronto Stock Exchange that morning of October 29, 1929, still heard the strains of the Charleston from the night before. The siren heralded the beginning of the trading day, but it wasn't long before the traders noticed that the ticker couldn't keep up with all the selling. Down, down went stock prices and with the crash began the Great Depression. dole: term used to describe welfare vouchers. People were instantly identified with welfare when they paid for their groceries with these vouchers.dole. 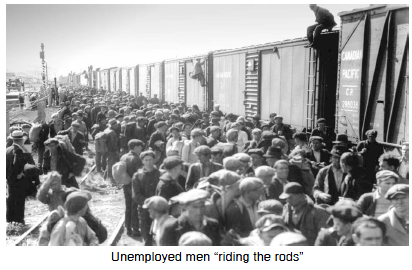 In Saskatchewan in 1937, 125,000 people were forced off their farms, never to return. People did whatever they could to make a few dollars and many men jumped on freight trains to go from town to town in search of work. inflation: a sharp and sudden rise in prices caused by issuing too much paper money or bank credit.inflation and prices were low. The depression saw the founding of the Cooperative Commonwealth Federation, or the CCF, in 1933. It was the forerunner of today's New Democratic Party. In addition, other reform movements started such as the Social Credit in Alberta in 1935. Even R.B. Bennett, towards the end of his tenure as Conservative Prime Minister, said as he introduced his new deal, "If we cannot abolish the dole, we should abolish the system." The pressure on Prime Minister Mackenzie King's government to bring about social advances required a centralizing of power in order to afford these new programmes. As the depression deepened it showed the lopsidedness of Confederation. The provinces had most of the responsibilities to the destitute, but little of the power to raise money. The federal government had broad taxing powers, but few specific social responsibilities. Both levels of government remembered these inadequacies as they entered World War II and the federal government met little opposition when it began to introduce centralized social programmes.